Pill bugs are commonly found in damp environments like compost, piles of leaves or under logs. They are crustaceans but can spend their entire lives on land, unlike lobsters, crabs, shrimp and other members of the crustacean family. According to Northern State University, there are approximately 4,000 species of pill bugs, which are also commonly called sowbugs, woodlice or rollie-pollies. Pill bugs are small crustaceans approximately 3/4-inch in length with seven pairs of legs and two antennae. 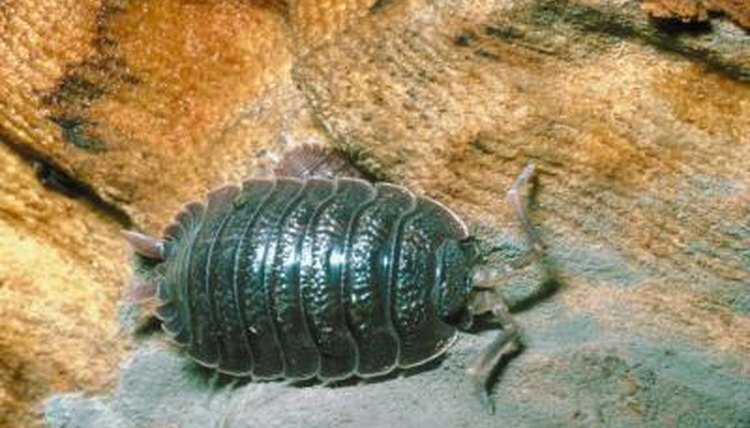 The outer cuticle is dark brown or black in color and is segmented, giving pill bugs the unique ability to roll up into a ball when they're disturbed. The main part of the body has seven segments, with five additional, smaller segments behind them. Pill bugs also have another set of appendages called uropods, at the rear. Uropods are used to sense potential danger. Unlike insects and spiders, pill bugs do not have good waterproofing cuticle wax. For this reason, they must live in damp locations or they will easily dry out. For example, according to Northern State University, woodlice would dehydrate and die within a day if kept in an environment with less than 50 percent humidity. Pill bugs are nocturnal and dine mainly on rotting vegetation such as fallen leaves or wood. They mate from May to September. After mating, the female lays eggs in a fluid-filled pouch. The eggs hatch after only a few days and live for several hours before the pouch breaks open. Pill bugs molt every few weeks. Pill bugs play a role in decomposition. After feeding on decomposing plants, they return the organic material to the soil so it can be further digested into nutrients for growing plants. They're also able to remove toxic metals from the soil during the digestion process. Pill bugs are not known to carry or transmit disease and cause minimal, if any, damage to live plants.